Over the past few decades designers and policymakers have been working to increase the energy efficiency of buildings, and solid progress has been made. Still, today in the United States buildings account for 49 percent of energy use and 46 percent of greenhouse gas emissions. Successfully tackling the dual challenges of rising energy costs and climate change is going to take massive reductions of building energy use. 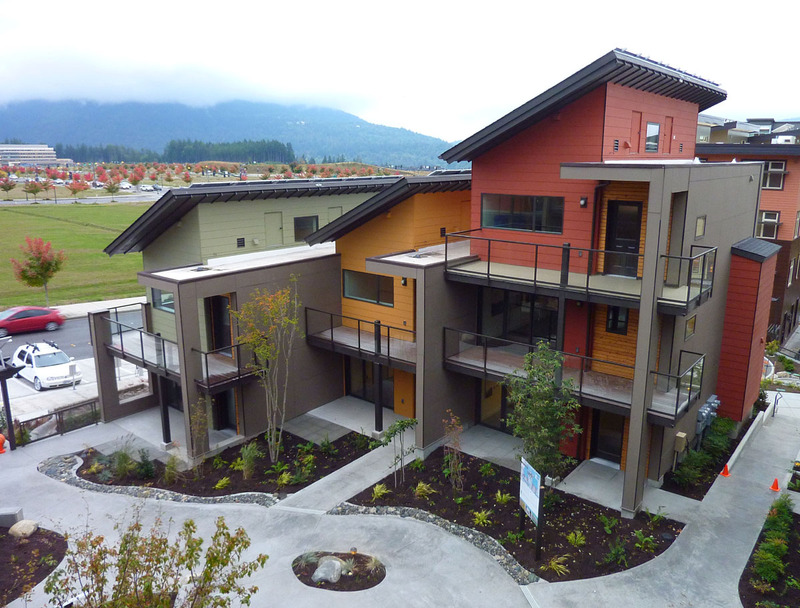 Spearheaded by the City of Issaquah, the zHome project was awarded to David Vandervort Architects in Fall 2007, but subsequently the real estate bust forced the original builder to back out. Howland Homes took over in Summer 2008, and the project broke ground that September. Faced with financing challenges and delays, Howland then partnered with Ichijo, a large Japanese builder known for energy-efficient production homes, and the project finished in September 2011.
zHome was designed to achieve zero net energy use through efficiency measures that reduce consumption by about two-thirds, and photovoltaics (PV) that generate enough electricity to cover the remaining third—approximately 5,000 kWh per year. 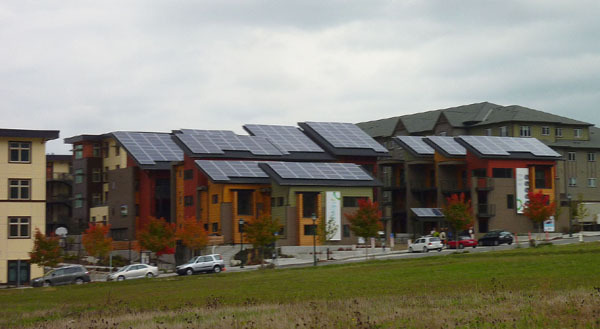 That requires a hefty amount of PV, and indeed, the south-facing panels that cover the roofs are a prominent feature. During the sunny summer months the PV produce more energy than the buildings need, and the excess is fed back to the grid. If the building operates as expected, that “banked” energy will offset the energy consumed during the dark winter months when PV output is low, the result being zero net energy use on an annual basis. So how much did all that extra stuff increase the cost? Asking prices for the units are relatively high for Issaquah: $385k for 799 s.f. 1-bedroom; $530k for 1350 s.f. 2 bedroom; and $625k for 1694 s.f. 3-bedroom. Apparently the free land and significant logistical support provided by the City weren’t enough to negate the cost premium. Eventually the upfront investment in efficiency would be offset by savings in the energy (and water) bills, but given current energy prices payback periods are relatively long. Of course, if all the externalized costs of our energy were included it would be a different story, but unfortunately a carbon tax is not happening any time soon. It remains to be seen if zHome will achieve zero net energy performance in the real world, and success will likely depend to some extent on the energy use habits of the occupants—one thing designers don’t have much control over. In any case, whether or not a building can produce enough energy on site to hit net-zero isn’t necessarily the be all and end all for sustainable design. Arguably, what’s more important is the practice of “efficiency first”—that is, first figure out how to fully minimize the building’s energy use, and then worry about how to supply the remaining energy demand. For example, the Bullitt Foundation’s Living Building is targeting zero net energy and incorporates cutting-edge energy-efficient design. But analysis suggests that it could have been even more efficient if it had been built to the European Passive House standard, in which case it would have required less PV, potentially reducing both cost and physical design constraints. Furthermore, when you look beyond the single building and consider larger systems of buildings and energy production, in some cases powering a building from an offsite energy source may make more sense than struggling to max out on-site generation. And for buildings taller than about six or seven stories, there simply won’t be enough solar energy impinging on the site to meet demand, even for a hyper-efficient building. 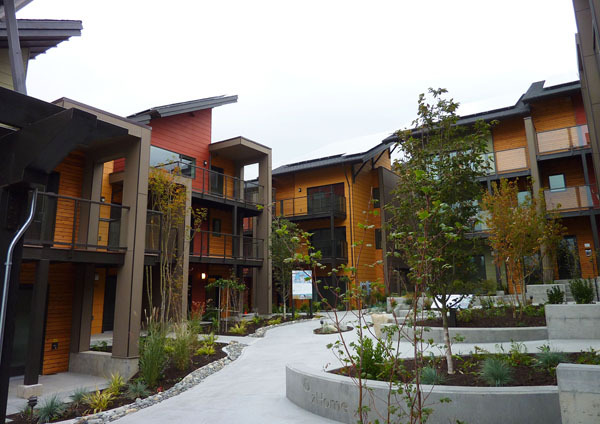 In conclusion, while the concept of zero net energy buildings may have its limitations, projects like zHome and the Bullitt Foundation building remain hugely important for making progress on energy-efficient design. That’s because they challenge designers to (1) work within a highly constrained energy budget, and (2) explore the limits of on-site energy production. And then there’s also the potential for the big win as the designs move into the mainstream. Indeed, Ichijo has ambitions to ramp up the zHome concept to high-volume production. It won’t be a moment too soon. Dan Bertolet is an urban planner with VIA Architecture and the founder of Citytank. All photos by the author. All apologies for the the title reference. With the cost of solar dropping down to (or past?) the cost of generated electricity, I think we’ll start seeing completely-solar roofs as a standart aspect of building design. Of course, that should be completely seperate from designing an efficient building. Zero is just a number, and besides bragging rights and generating the (likely incorrect) feeling that you’re not contributing to greenhouse gases, saving energy use is the important feature of these homes. zHomes as ‘tightly sealed’ – i’ve seen this mentioned in a few places, but they blew 2.85-4ACH50 on their blower door tests. in most of the EU, it’s recommended or required to be at 1.5ACH50 or better with MVHR (which zHomes utilizes). It’s also a 400%+ increase over passivhaus airtightness requirements of 0.6ACH50. I went to them and they are really nicely built homes, but still too pricey in my opinion. I asked the one director if it was allowable to set up a vegetable garden and they said yes but would discourage it as the city of Issaquah would be (or has a near by p- patch I cannot remember.) They are definitively a step in the right direction and one day when ST Link makes it out that way I would consider living there. the developer even owns the second lot and plans to build a second series of Z-homes depending on how things turn out with theses. That is what you all should try and lobby for Passuivehuas standards for.